The day of the race I got out of bed at 5:30. My wife and I had discussed several options about me getting to the race and her and the kids cheering me on, and in the end, given that 1.) I am an insufferable ball of nerves on race day and 2.) 3-ish hours is a long time to keep the kids reined in and safe at just about any location, I opted to take my mother’s car to the race site. I had a plan to really, really fuel for this race to see if I could squeeze a little more performance out of the old body, so I had a whole-grain bagel with chia seeds and peanut butter for breakfast (I took a pic of it, but it turned out too blurry - sorry, foodies). 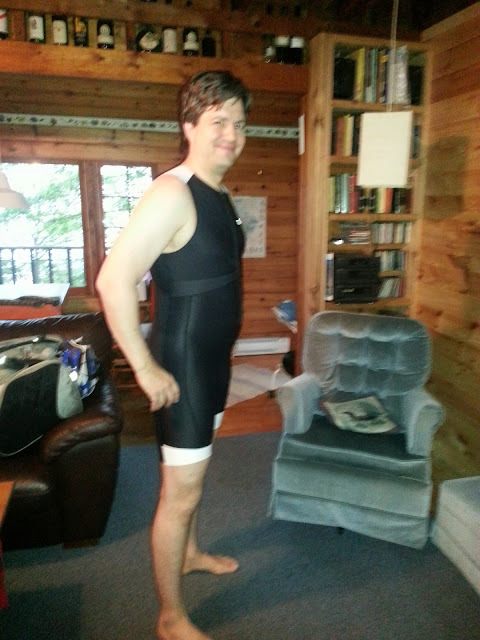 I was also trying a new one-piece suit for the first time. That was a little risky, but the worst pre-race news was that I had left my heart-rate monitor sensor strap at home. My race checklist has 'Garmin' on it, but that item has two parts, and one got missed. This was going to go one of two ways: either not knowing my heart rate would make me less conservative and really let me swing for the fences for better time, or I would blow up for lack of being able to keep my pace in check. There was a lot of fog on the way to Huntsville, but the very latest weather forecast was substituting the threats of thunderstorms for threats of sweltering heat, and I figured (correctly) that the fog would burn off and never be a factor. 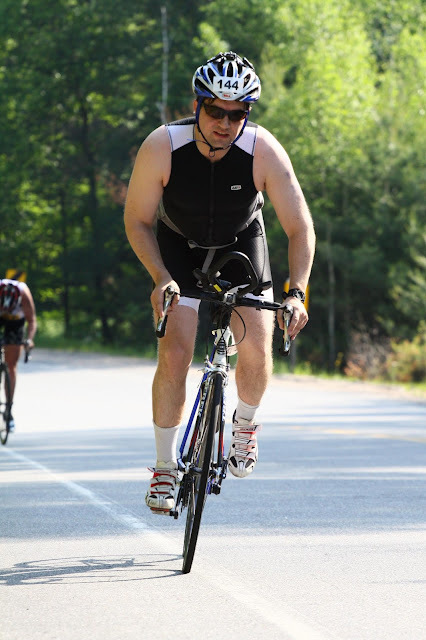 I found plenty of space on the Men’s 40-44 rack to place my bike and transition bag; at the time I figured I was at the race site earlier than I usually was, but afterwards I noted my age group only had 22 participants. I didn't do any transition setup at first, I just wanted to drop my stuff off before picking up the race kit. They used to have all that inside the Muskoka Summit Centre’s Arena, but this year it was around the back of the building. Still, the various steps of race kit pickup (look up your number, sign the waiver, pick-up the kit, pick-up the t-shirt, then race-chip anklet and body marking) were all clearly delineated which is not only beginner-friendly but also good for experience triathletes who are still nervous with cluttered brains like me. Unfortunately they were out of large size in the technical t-shirts, but they offered to send me one afterwards or I could take a cotton t-shirt that day. My old Muskoka triathlon t-shirts (from the ‘Muskoka Chase’ days, i.e. pre 5150 branding) are wearing out with holes etc. and I have plenty of technical t-shirts so I opted for the cotton. Back in the transition area, I started my setup. I got right with my equipment placement and took a picture, then I realized I had forgot something, and took another picture.... lather, rinse repeat. 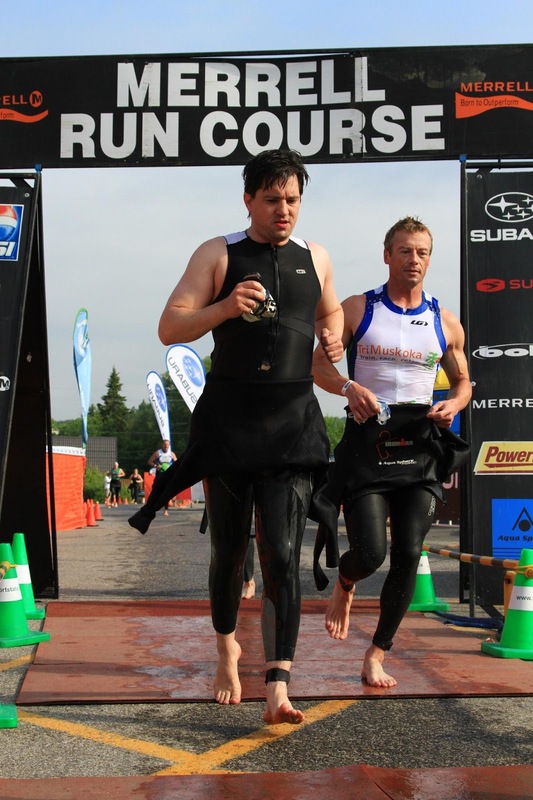 Two new things to me would be wearing my Garmin in the swim - meaning I’d have to strap it on outside the wetsuit, and take it off to remove the wetsuit - and bringing some leftover Clifshots (courtesy of DarwinianFail) to the swim start for energy on the swim. I did some shoulder mobility exercises with an old belt and ate a banana before heading to the swim start. The swim start is 800 m down a gravelly road from transition; you can either have friends/family along to take your shoes from you when you get in the water, or give them to a volunteer to tag and bag so that they’ll be brought back to transition. I should have chose the latter since I was on my own, and I meant to ask if I could include my camera in that deal, but race-day nerves ruled again and I forgot the whole thing and I made my way barefoot. I wasn't the only one, and it was do-able, just slow as you had to pick your way carefully. At the swim start I pulled on my wet-suit on my own, and I’m proud to say I probably did a better job of that than I ever had before. I did some more stretching, then with my Clifshots under my swim cap, entered the water. I only had a few minutes to do a few warm-up strokes before the race started - my wave wouldn't start until about 10 minutes after the pros and elites started, which was 8AM sharp. I stuck to one side so that I'd be on the outside of the turn and be able to take it at a more gradual angle and so that I wouldn't be in the middle of the crowd. I still ended up being boxed in between two other guys with a similar pace than me. I took a quick burst of speed with the hopes of putting them on my feet and giving myself some space, but they caught me again after a few hundred meters, so I did the opposite and let them both go by. I noticed my technique was a little wonky and felt a little guilty about it, but I was sighting often and I knew I was staying on course, so at least that was efficient. I made the first two turns and I was on my way out of the bay and into the channel when my Garmin buzzed its first 500 m alert. Feeling good so far, one third of the swim done. Making your way up the channel is confusing for some people because they don't know what side to put the buoys on (the race directions to tell you, but it's easy to miss in the pre-race excitement when you have plugs and/or water in your ears) - the secret is, it doesn't matter. The buoys just mark the way up the channel, so you can just follow the way and go to either side of them, and I know this from previous years. Moving up the channel is when the current starts. Swimming against the current is weird because it doesn't actually feel that slow at first. When you have the wind against you on land, you notice the slow-down because you use the land as a frame of reference for how fast you're going. When you swim, you don't get that good a look at the shoreline going by, but you see particles in the water flying by somewhat quickly and it makes it seem like you're flying through the water. This part of the swim just takes patience, and soon the next 500 m alert went off. I kept plugging away and approached the bend in the river which always messes with your brain, because you can see the Summit Centre and transition so you think you're nearly done; you still have a bit to go after you turn the corner. Strangely ,the third alert went off shortly thereafter - there were clearly 200-300 m left to swim and Garmin is telling me I'm done my 1500 m. Still, I pushed on with a minor final burst and exited the water. I was still messing around with the Garmin as I exited the water while I should have been pulling my wet-suit off. I was walking not running; I said in the pre-race that I didn't feel my transitions needed much improvement, but I wound up having to sit down to take off the suit, and everything was just a little more awkward than I would have liked. I looked at the winner of the race's T1 time and it's less than 30 seconds! Something to work on after all. I mounted the bike cleanly and clipped in without problems. I spun the pedals for a few kilometers when I noticed I hadn't brought the Garmin from my wrist to the quick release bike mount. I figured I could do it while riding; risky, but I wanted the convenience. I managed it without crashing the bike or anything, but I had accidentally hit the 'Lap' button which signalled the Garmin that I was done biking and had entered T2; I was 3 km into my ride. I managed to reset everything and start tracking the bike as a stand-alone event (which is why the end result below shows 37 km). I also noticed the cadence sensor wasn't working, which meant I only had my speed to guide me in terms of how I was doing. At 8 km in 19:33 I knew I was going about 24 km/h - a lot less than the 30 km/h I've always dreamed of. The water bottle I used was less that optimal. It had a twist top that I had to unscrew and juggle the lid in the aero position. Tricky as heck; I found 3 tops and 2 bottoms to various water bottles I've collected over the years, but I had no good ones available on race day, so I went with what I had. Luckily (again) I didn't crash the bike with my multi-tasking shenanigans. Lots of climbing, not much else to say about the course. I'm simply undertrained for hills; not just in terms of strength and conditioning, but I found myself in too light a gear and over-spinning as I'd crest many hills. In other words, I need to work on the skill parts too. I took a gel 22 minutes into my revised time when I wanted to take it 15 minutes into the overall ride. The turnaround point in Port Sydney is preceded by a stretch that is not only pretty, but pleasantly flat and really can put a smile on your face. After the turn-around, I found myself whistling 'Bobby McGee' - which I'd heard on the radio on the way to the race. The way back is more downhill than the way there, but still plenty of climbing. I took a Gu Roctane at the 1 hour mark, and though the package was orange, I swear it tasted like chocolate. I got out of the saddle a fair bit for the last kilometer or two to make sure nothing was too cramped up in my legs. I dismounted and stopped the Garmin. It showed 1:25:13, which was already more than the 1:22 I wanted to beat, and I had no idea how long those first 3 (wasted) km had taken me. 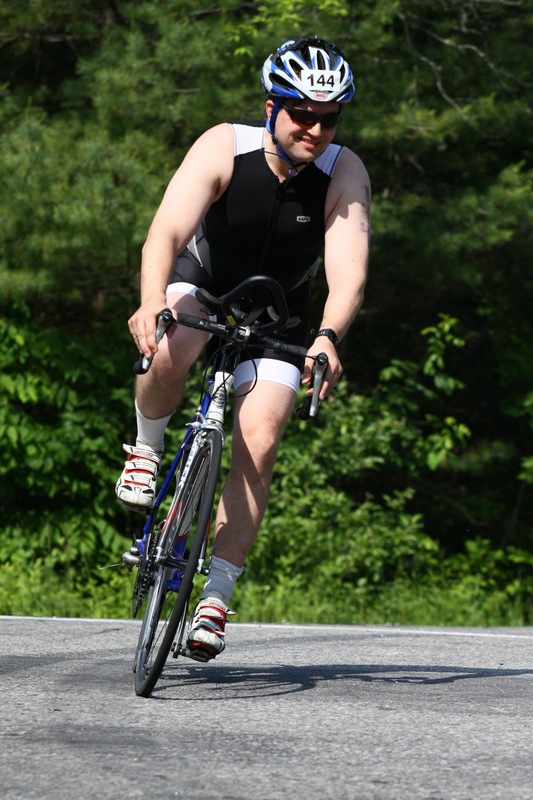 I racked the bike, took off my helmet, and switched shoes. One last sip of water, and monkeying with the Garmin to switch to running, and I was off. I had a sun-visor packed but not set out in transition so I opted not to go digging for it. It was starting to get hot, and I was expecting it. Luckily there were plenty of aid stations with water and Gatorade, and some were placed near turning points like the high school track you had to make a lap of, so you passed it twice within a couple of minutes of each other. I dumped anywhere from one to one and a half cups of water over my head at every single aid station. The 10 km course was two laps of a 5 km loop. The first loop I felt strong. I took a gel, so I was fueled, I felt hydrated, not thirsty (I usually have the opposite problem when you have too much liquid in you...), and I was doing everything I could to stay cool. The route was, you guessed it, hilly. I averaged a pace of 5:32 per km on the first loop, but as I closed it off, I saw my mom who gave me a big cheer, yet I was starting to weaken. I saw my wife and kids as I completed the first loop and shouted out that I loved them, and started on loop 2. I'm not quite sure what happened as it was nothing as straightforward as bonking, or injury or being dehydrated or even overheated. My muscles simply weren't firing all the way anymore. I'm sad to report I had a lot of negative self-talk when I saw my chances of beating last year's time slipping away "It's too hard... I need to slow down." There was a more positive voice in my head arguing back, but I'm still a little shocked because I don't think of myself as having that kind of negative attitude most of the time. 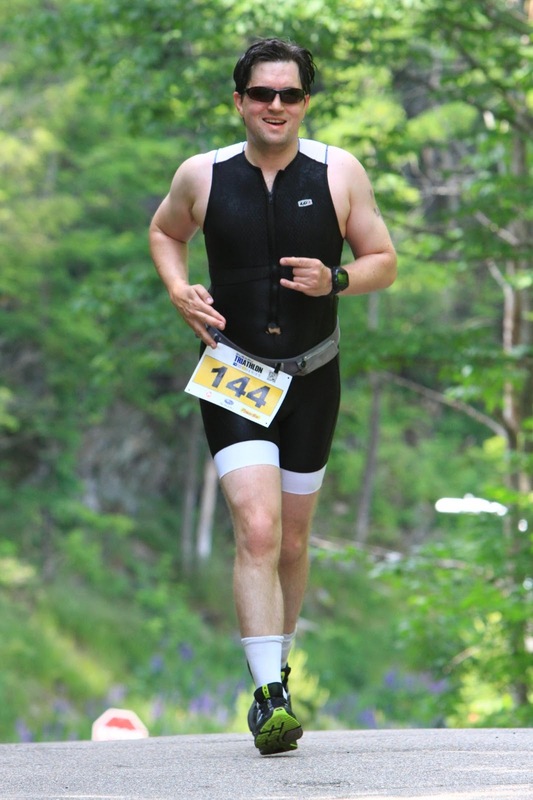 There was one guy, who grunted and moaned whenever he found the terrain a little difficult (there's a gravelly trail downhill section just before the 3 or 8 km mark, for example), and I found myself wanting to get away from him and the negative vibes he was giving off. Unfortunately, he had an average pace much like mine so I kept seeing Grunty McWhinerson around every turn. I actually had thoughts about outright quitting the race, but that kind of pain only kicked in around 9.2 km and it was frankly easier to just finish. I did speed up for the final half kilometre, and since I knew a personal record for the course was no longer in reach, I grabbed up Shark Boy and carried him across the finish line to give him a taste of that thrill (I kind of wanted to carry both kids, but I was a little tired by that point). I could complain about the heat, but when it comes to weather, you can have storms cancelling the swim (or more), heavy winds ruin your bike ride, and I simply don't like being rained on. It was a beautiful day. 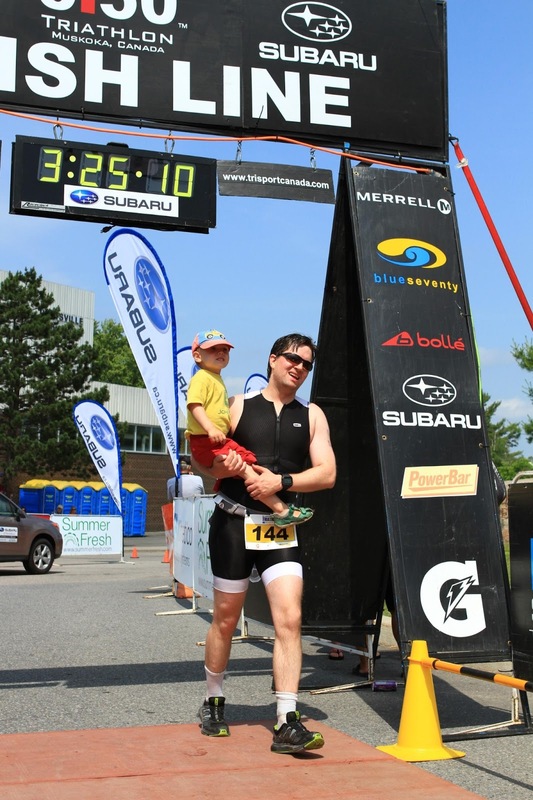 The race was well run, and I never wanted for anything, they even handed out gels at the aid stations. The volunteers were fantastic, smiling, and always doing their thing energetically. I finished, my family was proud of me and I had fun. I got to meet my inner coward, I think. I had the Garmin blues too, and didn't get the kind of data I want to have not only in real-time, but for afterwards. It looks like I have to investigate my cadence sensor and buy yet another water bottle. 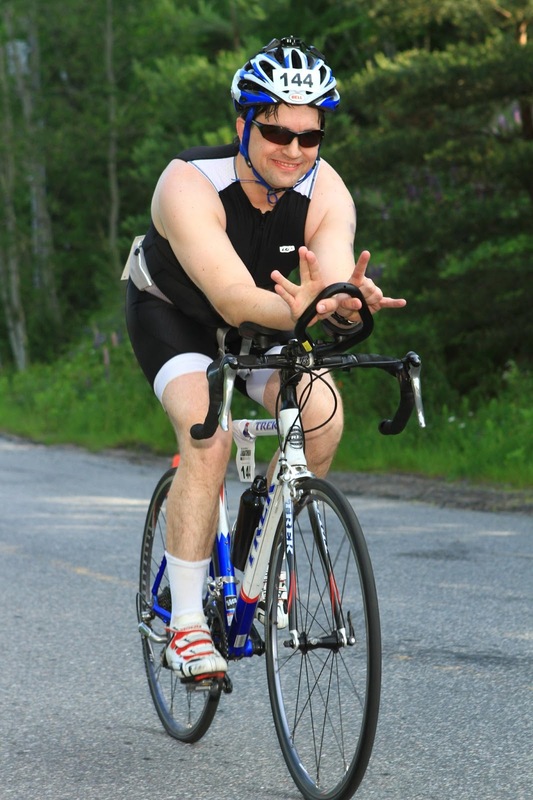 Nothing to see here; it's Triathlete Bodies in Muskoka, what do you expect? Lessons Learned and the Way Forward (it's the Training, Stupid). The difference between the race I wanted and the race I got is simply putting more time and distance in, especially in Muskoka-type terrain. I expect Bracebridge won't be that different in August, so it's going to be hills, hills and transition practice for me until then.